It is appropriate to begin this review by noting that this piece is unsuitably titled in a couple ways. 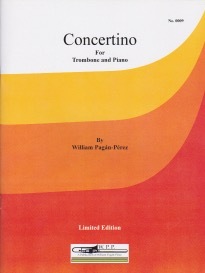 William Pagán-Pérez’s Concertino for trombone and piano was originally written for this combination of instruments, therefore nullifying the term concertino, as a concerto/concertino is a piece originally written for soloist and large ensemble. Also, by simply titling the piece Concertino, it fails to reference what appears to be the major source of the work’s inspiration – that of the Taíno people. The Taíno is a group of people indigenous to Puerto Rico, Mr. Pérez’s nation of origin. After looking further into the movement titles and their respective musical counterparts, it seems that Pérez wanted to make this a prominent feature of the work. The first movement, titled “Guasabara Dance” musically depicts the feelings of an uprising or riot, which is the definition of the Taíno word “Guasabara.” The racing pulse, punctuated rhythms, and generally loud dynamics permeate this riotous movement. It is the strongest movement musically for the ensemble but it presents endurance challenges as the bulk of the material sits at or above f1 and goes up to f2. It also contains little rest. Upon a brief glance, one might think the title of the second movement, “Bereceuse for my Little Naboria,” implies a lullaby for a child. However, the Taíno word “Naboria” refers to Taíno commoners, in contrast to “Nitainos,” or nobles. The melodic content much resembles a lullaby, and in fact quotes “Go to Sleep Little Baby,” but leaves something to be desired in the simplistic piano part, which repetitively arpeggiates three chords in triplets for the duration of the movement. The final movement, “Areyto” depicts a Taíno religious ceremony. This particular ceremony must have been one of excitement and vigorous dancing as demonstrated by the driving tempo and 6/8 meter. What the movement has in energy, it lacks in depth. The piano part is exceedingly repetitive and devoid of anything but rhythmic intensity. All the while, the trombonist performs melodies that are comprised solely of arpeggios. Think a more frantic version of the first movement of Rimsky-Korsakov’s Concerto. The music is clearly set visually, but has its share of awkward page turns. Due to endurance requirements, the need for a strong upper range, and the ability to navigate the gymnastic gestures in the third movement, this piece is suitable for the advanced performer.